While I was away visiting the inlaws last weekend, I made a very good start on Carol’s neighborhood Round Robin. 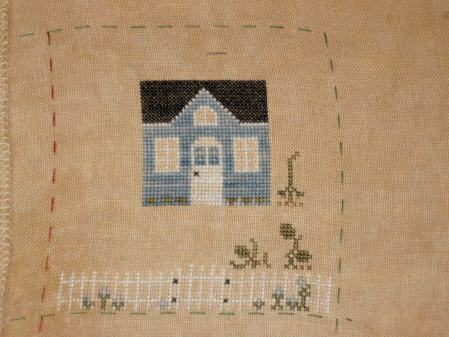 I am stitching Daisy Cottage by Country Cottage Needleworks. I had Allen pick all the hand dyed fibers for the piece. I think he made some fantastic choices and I am really liking how this is turning out. I just need to finish the daisies and maybe add something to the sky. This week I have been working on a new rotation of sorts to try and get some time in on my much neglected WIPS. This week it has been German Garden. I will post a pic of my progress in the morning. Right now I need to go tape some trim. Allen is going to start painting in th baby’s room tomorrow. We just found out the crib, etc is arriving about six weeks earlier than we expected. Hope you all had a fabulous Friday. I love it Leslie! Thank you! Your DH did do a nice job helping! Thank him for me too! I agree, the colours are lovely. So pretty! It is gorgeous, love the colours you DH has picked out. Love the RR square, the colors are gorgeous. Allen did a great job picking them out. I love the house color! Carol’s rr is looking just fantastic!